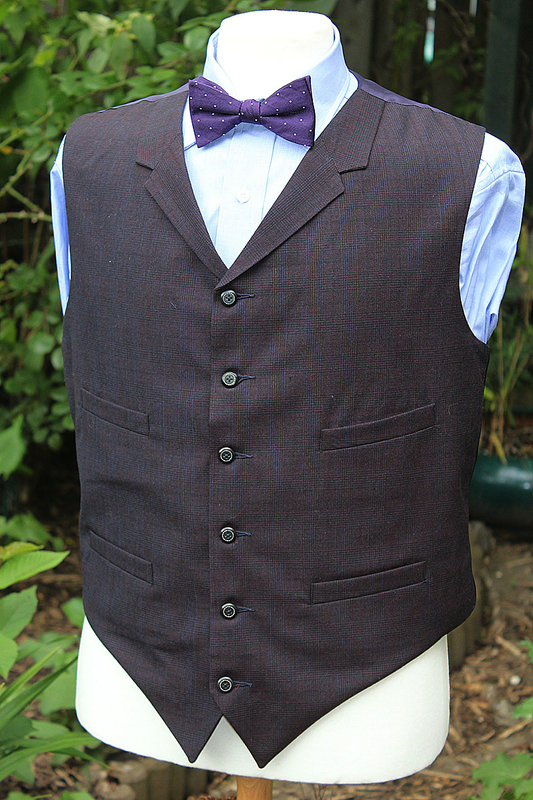 Now the trousers, at the time of their discovery back in late July 2009, were the easiest garment to find and obtain – and cheap into the bargain. 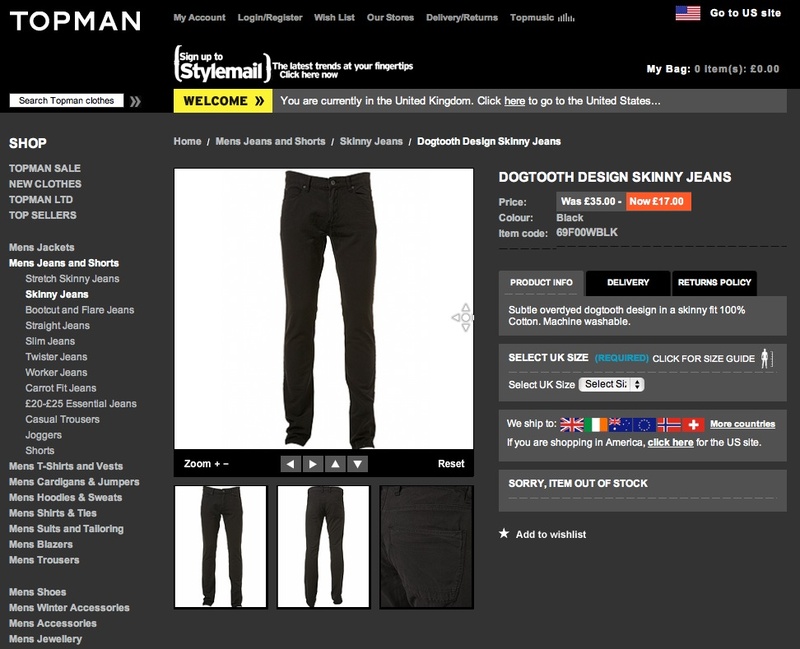 Someone spotted that they were a simple Houndstooth Skinny Jean from TopMan, and they were widely available for £35 at most branches across the UK. The only minor problem was finding a pair to fit. Most branches stocked the slimmer waist sizes, to target the younger, waif-like shoppers. 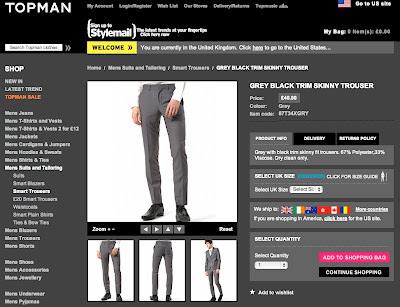 After trying a couple of stores – and feeling suitably old and out of touch – I retreated back to the safety of a cup of tea and internet shopping to find the trousers fully in stock on the TopMan website, right up to waist 36. 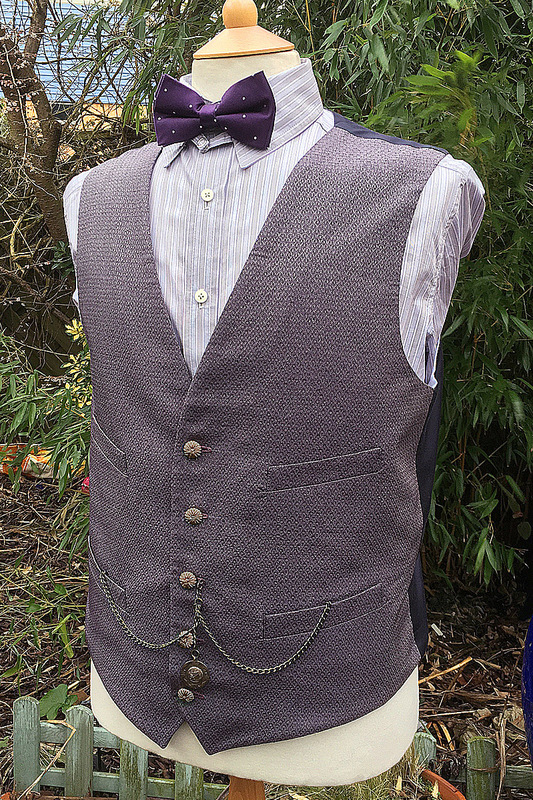 The purchase was painless and within a week I had my pair of trousers – and they fitted! 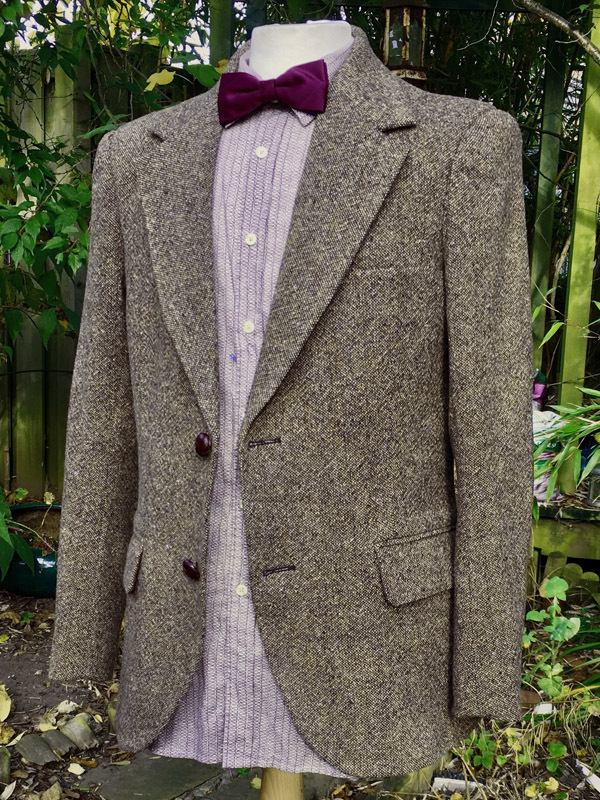 Since then, the style has been discontinued (as is becoming the routine with all the elements of Matt Smith’s costume it seems) and stocks rapidly ran out. I did just manage to grab a second pair online before supplies were totally depleted, and at half-price in their autumn sale, so a double result! Since then they have been totally sold out and are unobtainable. So my trousers are sorted. Then amazingly there was a second dip at getting a pair of matching screen-worn trousers. Some photos emerged of the filming for the last few episodes to go before the cameras. 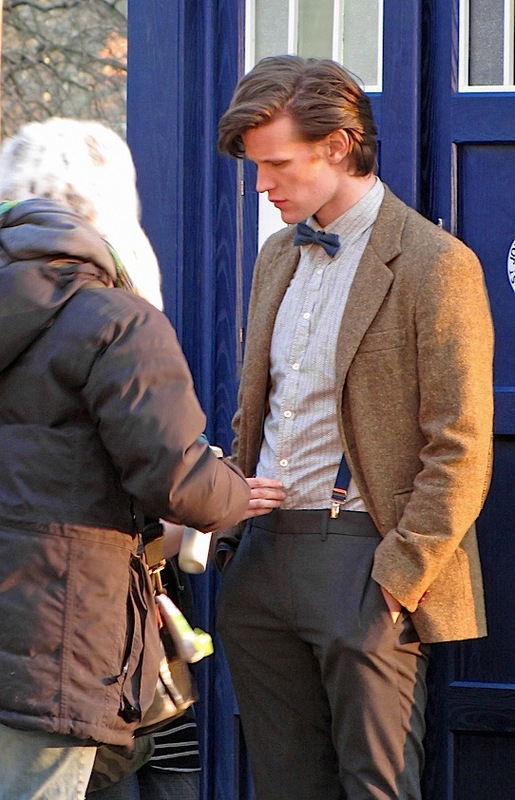 This time Matt could clearly be seen wearing trousers that were not a houndstooth pattern. Had he changed his trousers? Well, yes, apparently he had! The forums kicked in again and within a few hours it was spotted that they were again a pair of TopMan skinny jeans, but this time a grey plain colour. Again these were reasonably priced and available in all sizes. No point going to high street branches (after last time) so I opted for the online purchase as before. Dispatch was equally quick and another costume element is acquired and bites the dust! 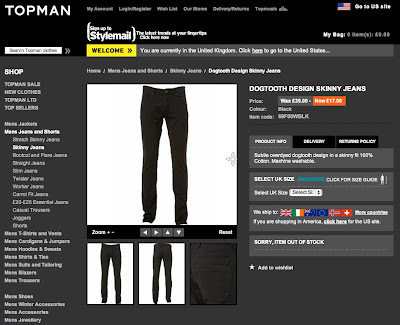 At the time or writing they are still on the TopMan website, but a slowly depleting range of sizes are on offer. Grab them while you can guys!!! pumpkiny, if you look at the big question video on the bbc site i think you'll see that matt is wearing this second pair of trousers. 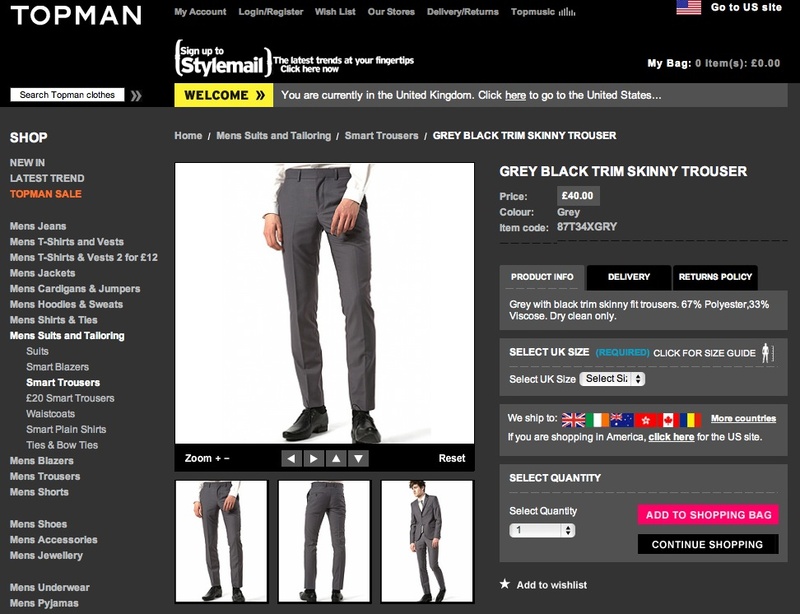 thing is though they look much darker than the grey with black trim topman pants. different lighting conditions are really making the pair hard to pin down and they key difference on all the topman trousers (after thoroughly scouring the shop in oxford circus) is the stitching on the side pockets. the grey with black trim definitely match in that respect, but the color does seem off. They are actually darker than what they seem in that pic. I went ahead and ordered a pair as I kicked myself holding off on the black version (which I actually prefer) and then they were gone. oh gosh, I wish I could pay this much attention ot the details of my costume, but eventually everything's just way too pricy and I end up scrambling in some drift stores. So, if I'm understanding this correctly... 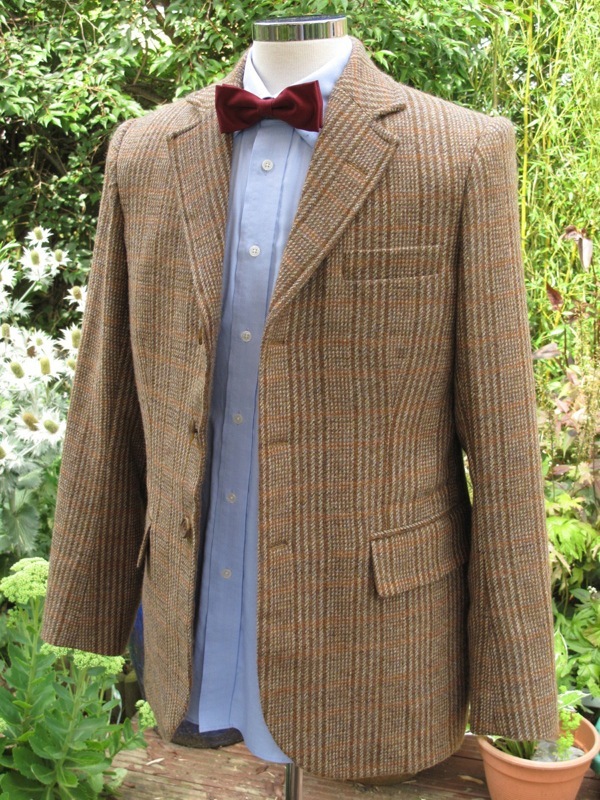 The Doctor wears a nice pair of jeans? I'm new to the world of clothing, so are they essentially the same as a pair of Wrangler's or Levi's, just perhaps a bit nicer and more expensive? Knowing this will help me put together a costume on a budget. Thanks!